The stock cars you will drive are built by our team of professional mechanics. For your safety, our fleet of cars is continually serviced and safety inspected. They are 600HP and will allow you to experience the fastest racetrack in the Northeast, The Tricky Triangle At Pocono Raceway. All cars are 4-speed transmissions. 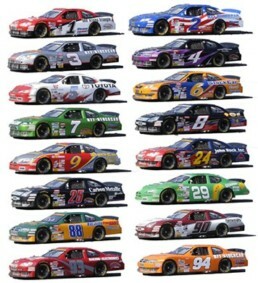 These are real stock cars, just like the big boys drive on Sunday. To drive or ride in one of our incredible machines Click Here! The Karts you will be racing are powered by a 390 cc, 13 hp Honda 4-stroke engine, capable of propelling these karts over 50 mph. 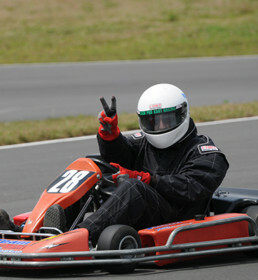 All karts are fitted with a sport-tuned exhaust to provide maximum torque. The tires are racing slicks for the ultimate in cornering speed and maximum traction. The power is put to the ground by a 428 size O-ring chain. A single speed oil bath wet clutch is sure to provide the reliability needed for Team Pro Kart Racing. Braking is provided by a hydraulic braking system. The fuel tank is located in the left side pod to provide the proper weight distribution and a low center of gravity. The karts are also equipped with a rub rail to help avoid interlocking wheels. Come join us for some wheel to wheel kart racing. Get your car on the 2.5 Mile Super Speedway. No speed limits and passing allowed. 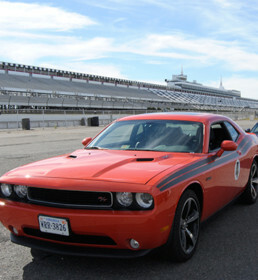 That’s right, drive your car on the same Tricky Triangle that the NASCAR Pro’s drive. Our experiences great gifts! All of make our programs are amazing and provide memories that will last a lifetime. To get your own car on the track, Drive Your Own Car.